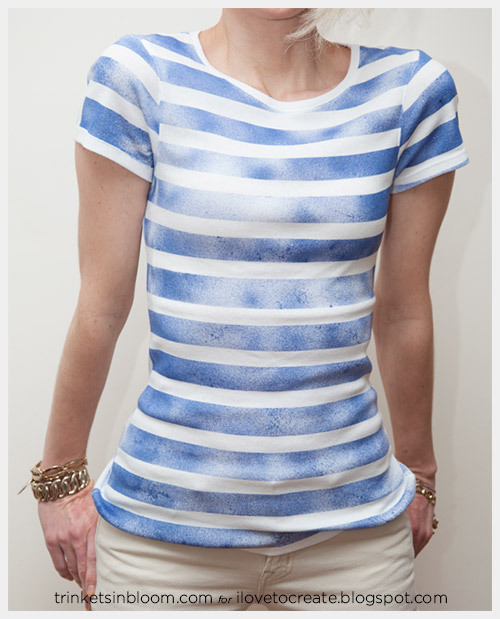 Mix up stripes and fabric spray paint in a fun DIY Striped T-shirt using fabric spray paint from Tulip. 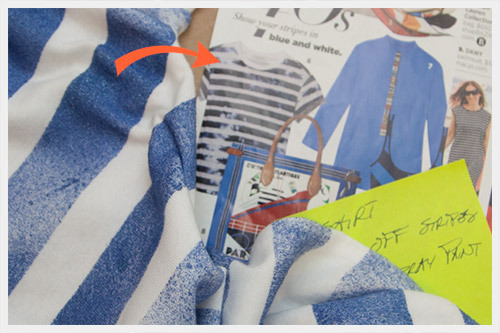 I was inspired to make this DIY Striped T-Shirt after seeing this printed striped "tie die" t-shirt in a magazine. 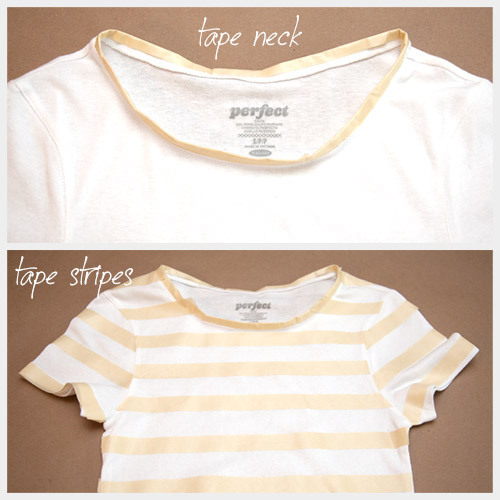 Lay your t-shirt out on a flat surface and start taping. I started by putting tape all around the neckline of my t-shirt. Then start taping your stripes. I just eyeballed my stripes (they’re not perfect). You can use a ruler to make them even, if you prefer. 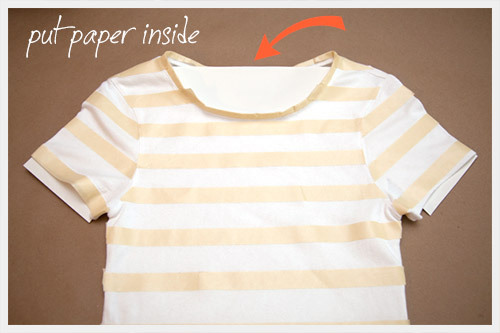 Put some paper or cardboard inside your t-shirt. You can also get one of these forms for a perfect fit. 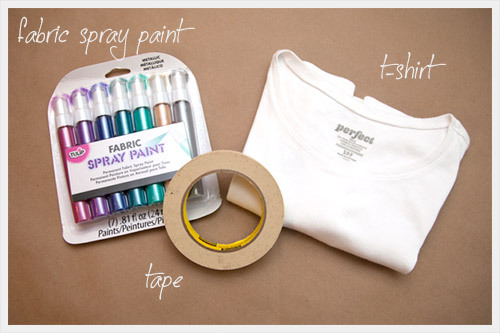 You can control how your spray paint goes onto your t-shirt by how you pump it. Press it down all the way for a finer mist that will cover more space or press it down half way for larger drops and a splatter effect. I actually ran out of spray paint by the time I got to the back of the t-shirt. (I know I really should've thought about it first.) So, I added a little water and shook it to get a bit of color on the back. However, being more watery it did bleed under my tape. So for next time what I would recommend would be (to either buy two of the same color or) use at least two colors and either mixing them if you don’t want strong patches of different colors or just really mix up the colors and go crazy! Peel off your tape to see your stripes! 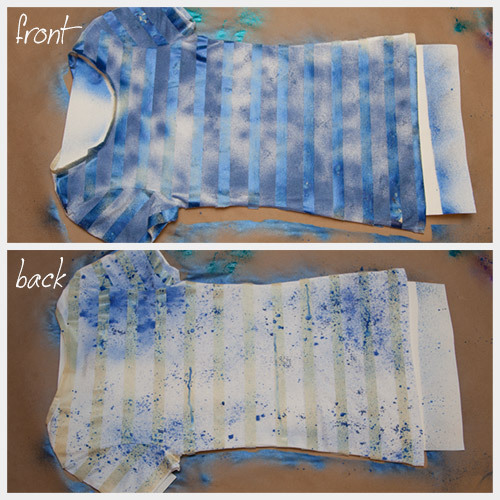 I was going for a crisp blue and white look for this t-shirt, but you could really make some beautiful stripes with these fabric paints by mixing colors and splattering your paint. 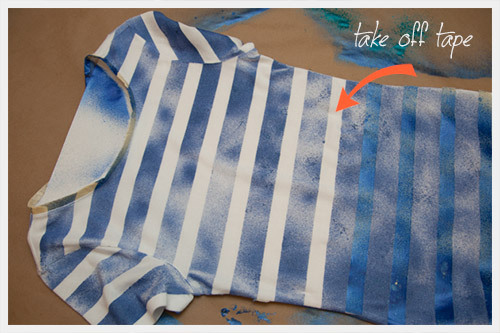 The fabric spray paint dries very quickly making this a really fun and quick project. The colors stayed very true and didn’t fade (the ones I used even have a hint of metallic) and they don't dry stiff or sticky, it feels very smooth. It worked so well with the tape, you could use this technique with all kinds of stencils! To see more projects and DIY's please check out my blog at trinketsinbloom.com. I love this!! Off to JoAnns this weekend. Great last photos too. Pinning!!! Thanks for posting your great work! The design looks very nice. I remember that we also used spray paint to design a shirt for a school project but I used index card for the lettering guide. Maybe I should use stencil next time. Anyway, will the design easily fade when washing? Thanks for sharing this wonderful blog. Really, I loved to read this review. Awesome idea! I have a paint sprayer and I'm going to do this. Thanks. This is a very helpful and informative article. You did a thorough explanation about spray painting, and very creative too. Thank you for sharing the knowledge and the tips. Would love to see more. It is very informative post. you should also try t-shirt designer tool for more creativity.